The end of the Milky Way is already scheduled, and will be marked with fireworks. Some 4 billion years from now, the night skies will be lit by the glow of hundreds of billions of stars as the nearby Andromeda galaxy bears down on us. The two celestial giants will become one and stars, planets and gas clouds will be hurled into intergalactic space by titanic gravitational forces. Surviving stars and planets will be pitched into a jumbled cloud flaring up with new stars - floating into a long future not in the Milky Way, nor Andromeda, but a monstrous "Milkomeda" galaxy. It's a well-established picture of our galaxy's cataclysmic future. More controversially, it might also be a vision of its past. Observations indicate that the eviscerated remains of a past encounter between two celestial giants encircle our galaxy's neighborhood. Forbidden alignments of satellite galaxies, globular clusters and streams of stars trailing in our galactic wake all hint that our local cosmic history needs a rewrite. to explain what our telescopes are telling us, we may need to rethink that most mysterious of substances, dark matter - and perhaps our entire conception of how gravity works, too. in a strange configuration of tiny dwarf galaxies surrounding the Milky Way. In 2012, astronomer Marcel Pawlowski, then of the University of Bonn in Germany, dubbed it the "vast polar structure" (The VPOS - A Vast Polar Structure of Satellite Galaxies, Globular Clusters and Streams around the Milky Way). This was for the way the dwarfs line up in a ring that circles the galaxy at right angles to the main disc of stars, which contains our sun and everything else. But he was by no means the first to see it. That was Donald Lyndon-Bell of the University of Cambridge, who in 1976 pointed out that the satellite galaxies surrounding the Milky Way are not scattered randomly, but look as if something has corralled them into a distinct alignment. "They thought it could be the break-up of a larger galaxy, making it some form of debris stream," says Pawlowski, "There was an open discussion at the time, but then the topic became unpopular." "The alignment is exactly what you would expect if the two galaxies had interacted in the past"
The thing that made it unpopular was the rise of dark matter. Dark matter became a fixture in the 1970s to explain a glaring discrepancy between our standard cosmological models, rooted in the picture of gravity teased out by Newton and Einstein, and observations of reality. When astronomers measured the speed at which distant galaxies were rotating, they found these celestial bodies to be whirling round so fast they would fly apart if they relied only on visible matter's gravity to hold them together. This frenzied rotation could be explained if there were more to the galaxies than met the eye - if most of their matter were not made of conventional atoms, but of particles that did not interact with light and so were invisible. Dark matter fitted ideas being floated by physicists studying the universe's rambunctious early years, before stars and galaxies formed. In this searing environment, a panoply of new particles would have popped up to carry forces and energy. As the universe expanded and its temperature dropped, these particles would have lost their potency and become an inert, invisible soup. No one has ever detected or fabricated so much as a single particle of dark matter, yet its popularity has grown and grown. Our current standard model of cosmology has it outweighing normal matter by five to one. Existing in such quantities, dark matter not only explains galactic rotation, but also seems to be just the thing to allow galaxies such as the Milky Way to form. Tiny irregularities in the initial density of dark matter caused pockets of the stuff, unimpeded by interactions with anything else, to begin to collapse under their own weight. This pulled in normal matter, which collapsed down into flat, spinning discs of matter - galaxies. Simulations of this reproduce the observed form of galaxies like the Milky Way perfectly. Hot and cold spots we see in the cosmic microwave background, light sent pinging around the cosmos when it was just 380,000 years old, are interpreted as indicating the seeds of this process. And so we believe that galaxies today are surrounded by a cosseting "halo" of dark matter that generates gravity and keeps everything together. Those same simulations show how, as dark matter collapses to form a galaxy halo, parts of it fragment, trapping in-falling normal matter and giving rise to a population of dwarf galaxies randomly scattered around the larger parent galaxy. So it is a bit of a problem that the Milky Way's dwarf satellites are by no means randomly scattered. The huge success of the dark matter model meant most astronomers were content to turn a blind eye to this small embarrassment: the thought was we had simply not yet seen all the Milky Way's accompanying dwarfs. But in 2005, Pavel Kroupa, also at the University of Bonn, reanalyzed the satellite galaxy data and confirmed the striking mismatch with dark matter theory. Pawlowski, Kroupa's doctoral student, then went further. He studied the alignment of other objects in the halo of the Milky Way - spherical collections of stars much smaller than dwarf galaxies known as globular clusters, and long wispy trails of stars thought to form when dwarf galaxies break up. He found them marshaled just like the dwarf galaxies. To explain it all, Pawlowski channeled Lyndon-Bell's original suggestion that it could be the debris of an intergalactic collision and looked to see what the fallout of such a collision might be. He investigated whether dwarf galaxies could indeed form from the stuff left behind when two galaxies interacted. Astronomers see quite a few such galactic dances throughout the universe throwing out huge tails of stars and gas into space. Pawlowski's simulations confirmed that the Milky Way's dwarf galaxies could indeed form in their observed positions following such an encounter (image above). But what was it that danced with us? There was no obvious candidate until 2013, when Rodrigo Ibata of the Observatory of Strasbourg in France and his colleagues published observations (A Vast Thin Plane of Co-rotating Dwarf Galaxies Orbiting the Andromeda Galaxy) that showed a similar polar structure of dwarf galaxies exists around Andromeda, our nearest galactic neighbor some 2.5 million light years away. The dwarfs above the plane of Andromeda are moving away from us, while those at the bottom are heading towards us - convincing evidence that the disc is not a chance alignment, but a coherent, rotating structure. Andromeda's satellite disc is also rotating in the same sense as ours, and pointing at the Milky Way, albeit with a slight misalignment of about 35 degrees from our galaxy's polar structure. 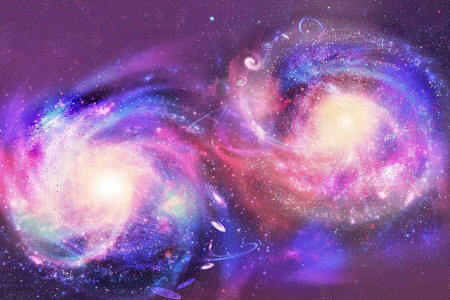 It is all exactly what you would expect if the two galaxies had interacted in the past. 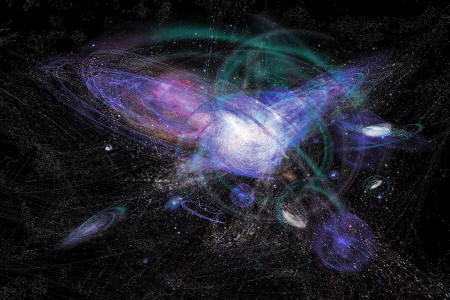 can we model galactic collisions? Even counting their presumed dark matter haloes, Andromeda and the Milky Way simply don't have enough mass, and thus mutual gravity, to have pulled them into a collision in the time available since the big bang. So it's a stalemate. Unless, that is, something is up with gravity. 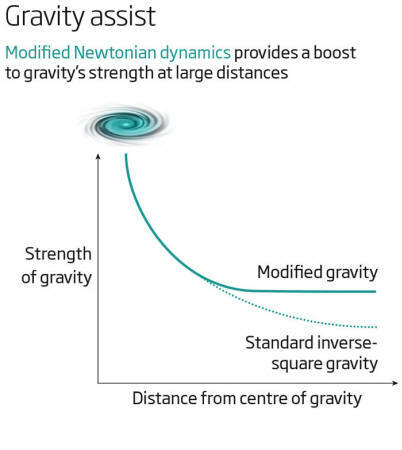 Newton's and Einstein's theories assume that gravity is a force whose strength declines with the square of the distance between two massive objects. That indeed seems to be the case on scales up to that of our solar system - the orbit of a body as far out as Pluto conforms to expectations. But it is an assumption we've never been able to test on larger scales. "Simply speaking, MONDian dynamics demands that there was a past interaction between the two," says Pawlowski. Even though the strength of gravity has never been tested in very weak fields, the idea that a force of nature should change its strength so readily is unpalatable to most. And MOND runs into problems when the scales get extremely large. In clusters of many galaxies, dark matter is still needed to hold everything together. And those hot and cold spots in the cosmic microwave background are very hard to explain without some form of dark matter assisting the collapse of normal matter into galaxies. All of this gave Pawlowski pause for thought, wondering whether the MOND idea might itself be modified not just to explain a past collision between the Milky Way and Andromeda, but also to fit all other observations. "Maybe MOND is telling us something about gravity," he says. "Or maybe it is telling us something about dark matter." Enter Justin Khoury with the self-same question - and perhaps an answer. A theoretical physicist at the University of Pennsylvania in Philadelphia, Khoury has long been fascinated by the success of MOND in describing cosmic dynamics up to the scale of galaxies - and its failure with anything bigger. "You need the component that modifies gravity on galaxy scales to go quiet on cosmological scales," he says. "How do you accommodate that?" Khoury's epiphany involves a superfluid state known as a Bose-Einstein condensate, which kicks in among some types of normal matter atoms once they drop below a certain temperature. In this state, the constituent particles begin to behave as one single, coherent mass that has no viscosity and flows without impediment. When the temperature rises again, they snap back out into a normal, viscous fluid state. "The superfluid would replicate dark matter on some scales, and modify gravity on others"
If dark matter particles could enter a Bose-Einstein state, Khoury reasoned, that would be just the thing to replicate MOND on certain scales, and ordinary dark matter on others. In the relatively weak gravitational fields of galaxies, dark matter would be slow-moving and have a low effective temperature. 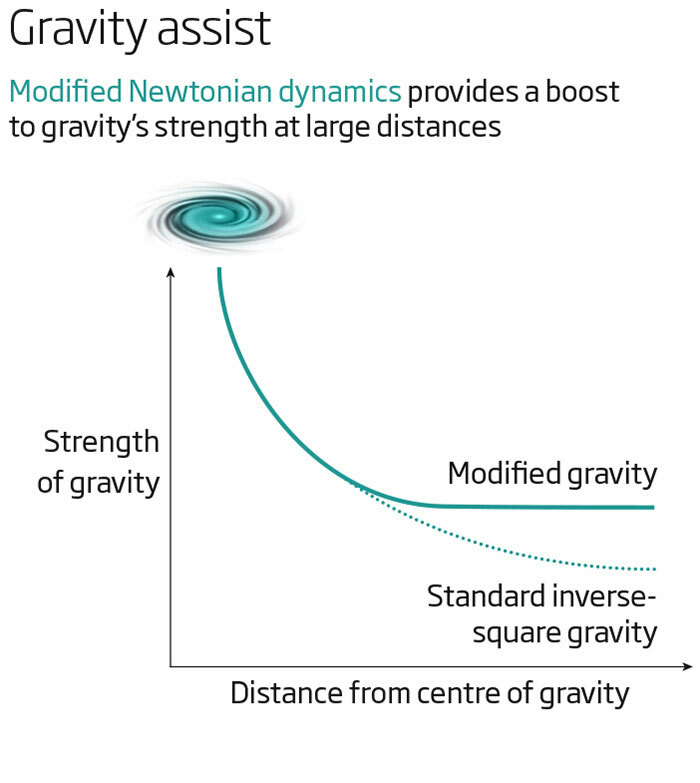 It would slip into a Bose-Einstein state whose energy would be spread uniformly across its extent, curving space and creating a MOND-like additional gravitational force. But in stronger gravitational fields, as found in galaxy clusters, the coherence would break and the matter would behave just like ordinary dark matter, contributing its own minuscule force of gravity particle by particle. This would also explain why we see no MONDian behavior on the scale of our solar system. With our sun, we have a very strong local source of gravity, so the condensate would break down on this local level. The same would be true of each of the Milky Way's stars, which would behave like impurities in the condensate. But because our galaxy, like all galaxies, is mainly empty space, the overall galactic condensate would still dominate (An Alternative to Particle Dark Matter). Khoury is not the first to suggest dark matter dynamics would naturally mimic those of a Bose-Einstein condensate, but he is the first to suggest it would lead to MOND-like variations in gravity, thus unifying bits of two models previously regarded as implacably opposed. For this hybrid model to work, his calculations suggest that the dark matter itself is a billion times lighter than current models indicate. Khoury is currently developing computer models to see how superfluid dark-matter haloes would affect how galaxies merge, and so see if there are any observations he could make to test the idea. He is also collaborating with a condensed-matter physicist colleague at the University of Pennsylvania, Tom Lubensky, to see if there is any supercooled atomic fluid known to create exactly the predicted effect. "If so, then perhaps we can use cold atom gases to simulate galaxies and mergers in the laboratory," he says. Some regard talk of superfluid dark matter modifying gravity as an unnecessary and unwelcome complication - a big disruption to explain the relatively small problem of strangely aligned dwarf galaxies. Ed Shaya of the University of Maryland in College Park, for instance, thinks that the mismatch between simulations and the reality of the dwarf galaxies is down to a lack of computing power, which limits the resolution of simulations. He believes that there are still solutions invoking ordinary physics and ordinary dark matter. "It is not yet time to give up on the standard model," he says. The distance between simulation and reality is stark for now. The vast polar structure's ring shape is about 500,000 light years in diameter, yet no more than 50,000 light years wide. Although some standard galaxy formation simulations can be rigged to produce similar alignments, they never produce rings less than a million light years in width. For Pawlowski, this mismatch is a big deal. "There are a number of problems that the standard model has on the scale of galaxies, but this is the biggest." None of this will affect our ultimate fate, as we serenely spiral towards the giant firework show at the end of our galaxy. But will that shock and awe display be a repeat performance? Who knows - and if we have to modify our ideas of gravity and dark matter, we can't pencil the next date into our diaries with much certainty, either.